The municipality has targeted five sectors for robust development. Two of these sectors, manufacturing and tourism, are currently active contributors to the local economy. The other two sectors, services, Renewable Industries and creative industries, have the potential to support economic growth. Five manufacturing subsectors (or industries) have a strong presence and potential for further development within the Nelson Mandela Bay area. Nelson Mandela Bay, undoubtedly the motor manufacturing mecca of Africa, is home to a vibrant and ever-growing industry which provides the basis of the region’s manufacturing capacity. The largest car manufacturer in the country, Volkswagen South Africa, a wholly-owned subsidiary of Volkswagen AG, is situated in Uitenhage. General Motor’s SA is a locally owned organization, while Ford SA is another Port Elizabeth based Original Equipment Manufacturer. The Struandale Ford engine plant manufactures and exports the Rocam engine used in the Ikon, Bantam and Ka models. The undisputable automotive gateway of Nelson Mandela Bay is the Port Elizabeth harbour. Nelson Mandela Bay is also home to automotive component manufactures that are well positioned to serve top Eastern Cape exporters like Volkswagen South Africa, General Motor SA. Vehicles manufacturers and component suppliers in this area have established themselves globally as reliable niche cap fillers. The European Union is the largest export destination for local component exports at the moment. Dairy, food processing, wool and mohair are the three primary active agro-processing industries in the Eastern Cape. There are opportunities to expand processing of Ultra High Temperature (UHT) milk, milk powder and cheese. There are also opportunities for new canning and juicing plants; as well as prospects for the processing of wool and mohair. The Eastern Cape is the leading world producer of high-quality merino wool and mohair fibres. However, three-quarters of the wool and mohair clips is exported semi-processed and approximately 20% completely raw. The challenge is to bring together designers, technology and investors to produce higher value for goods and exploit new markets. The Eastern Cape is renowned for its textiles and its status as a major producer of wool and mohair. Currently, key products being manufactured are seat covers, fabric and upholstery, industrial hosing, medical fabrics, clothing and the use of natural fabrics for bags, matting and carpeting. Areas being examined are the use of new materials like hemp, wool and mohair fashion items, and indigenous Xhosa designs in high quality fashion clothing. Two key opportunities that have been identified are a fibre processing plant to spin wool and mohair fibre into yarn, as well as a textile mill, centred on cotton, poly-cotton and acrylic fabric. Plastics and pharmaceuticals are the key chemical industries in the Eastern Cape. Nelson Mandela Bay is home to Aspen, the largest generics manufacturer in the southern hemisphere and the leading supplier of generic medicines to both the private and the public sectors in South Africa. Aspen is one of the top twenty generic manufacturers worldwide and South Africa’s number one generic brand. The plastics industry, albeit small, is highly diversified throughout the province where automotive, packaging, moulding and extrusion, household and construction industries are prominent. The Coega IDZ is in the process of establishing a metals cluster, with a potential aluminium smelter as an anchor tenant. Due to access to lower cost energy and adequate labour, the Coega IDZ provides a competitive cost margin which is conducive for this industry to thrive. Tourism is viewed as an important area of growth for Nelson Mandela Bay and the Eastern Cape at large. Key attractions in and around Nelson Mandela Bay include wildlife and outdoor, cultural, historical as well as adventure and sport related activities and attractions. Infrastructural developments that are necessary for tourism growth have been prioritised by the Nelson Mandela Bay Municipality. Nelson Mandela Bay has seen steady growth in the tourism industry in terms of both local and international visitors, resulting in an average annual increase of approximately 10%. This trend has seen the growth of township tourism, thereby strategically positioning Nelson Mandela Bay to benefit. A number of initiatives, city and provincial, private and public have been launched with the specific intention of building and developing the film industry within Nelson Mandela Bay and the Eastern Cape at large. Nelson Mandela Bay and its environs have played host to a number of national and international feature films. The city was selected because of the untapped freshness of the locations and "grime free urban environment”. A variety of top quality locations are available in and around Nelson Mandela Bay. South Africa and its compatible time zone (GMT+2) allows for effortless adaptation from America or Europe. The services sector, comprising of the Business Process Outsourcing (BPO) and the Information Communication Technology (ICT) industries, present viable prospects for growth and especially employment creation. 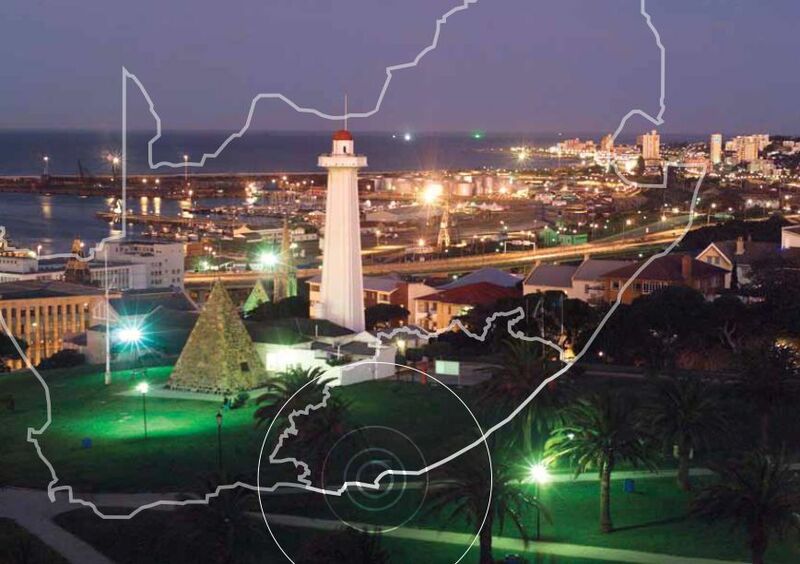 Nelson Mandela Bay has been identified as a prime location for call centres and back office operations serving South Africa, Africa, Europe and the rest of the English-speaking world. The provincial government’s approach to ICT is outward looking, with plans to boost technology advances in underdeveloped communities while it also aims to facilitate BPO investment in Nelson Mandela Bay and the rest of the province. Nelson Mandela Bay being the only city in South Africa with two operational ports offers an opportunity for outsources trading in the freight-forwarding and local or international logistics spheres. The Coega Development Corporation (CDC) in its investor-attraction drive has constructed a 9000 m2 ‘BPO Park’ facility, which is a fully equipped ‘plug and play’ facility for any prospective BPO investor seeking to leverage on the opportunities. According to Statistics South Africa’s 2001 census, the city of Nelson Mandela Bay is the most populous city in South Africa with over 775 000 inhabitants. The region is also home to two universities and has a number of private and public further educational facilities at its disposal. The Nelson Mandela Bay Municipality has partnered with the CDC for the training and development of unemployed individuals for the BPO market. These young persons were trained as part of a pilot programme to ascertain the ability of training providers in the region to provide the necessary BPO-specific training required by the industry. Therefore, there is a reliable supply of skilled labour in the region that can easily be absorbed by any investor in the BPO market. Given the small call center base in the region and the close proximity of all citizens to the commercial centers, the labour costs, travelling time and attrition rates are extremely low in the Nelson Mandela Bay region, compared to the more developed markets in the country. Port Elizabeth is referred to as a 15-minute city and this is illustrated by the fact that it takes a mere 20 minutes to travel from the Uitenhage CBD to Port Elizabeth. Nelson Mandela Bay has good road and rail communications and an International Airport providing effective links within and beyond South Africa. The Nelson Mandela Bay Municipality is embarking on a drive of creating sustainable employment, diversifying the key sectors, strengthening competitiveness. The Renewable Energy sector is one of the targeted sectors identified for diversification and one of the fast growing owing to the IPP programme of the Department of Energy. Generation and Components Manufacturing Industry is one of the key targeted sectors. The development of this sector is prioritized in the proposed Nelson Mandela Bay region Industrial Developed Strategy.